The USS Orion (AS-18) keel was laid down in Oakland , CA at the Moore Dry Dock company on 31 July 1941. Two years, one month and thirty days later, on 30 September 1943, USS Orion (AS-18) was commissioned on 30 September 1943 with Capt. C. S. Isgrig, commanding. USS Orion was named for a constellation commonly known as The Hunter. After fit out and shake down training, USS Orion departed for the Western Pacific at the height ot of World War II. First stationed at Fremantle, Australia, then Mios Woendi, Indonesia , Orion supported the Western Pacific Submarines pressing the war in Japanese held territory. Deployed from December 1943, she returned to Pearl Harbor for maintenance and upkeep in December 1944. The last year of the War had Orion returning to duty at Saipan in April, 1945. The end of the war had USS Orion stationed in the Atlantic for a short period then spending more than three years in the Panama Canal zone. In 1949 she changed home ports to Norfolk, Virginia. Subsequent years brought the routine, but essential work of supporting the US Atlantic submarine force. As the years progressed, USS Orion progressed with them, gaining the capability to support nuclear submarines. While spending most of her time in Norfolk supporting submarines and destroyers, Orion rarely ventured far. In the 1980's Orion changed her home port to La Maddalena, Italy returning to Norfolk in 1993. USS Orion (AS-18) was decommissioned on 3 SEP 1993. In 2006 she was sold to American Ship Recyclers of Baltimore for scrapping. The second Orion (AS-18) was laid down 31 July 1941 at the Moore Dry Dock Co. Oakland Calif.; launched 24 June 1942; sponsored by Mrs. Robert A. White; and commissioned 30 September 1943 Capt. C. S. Isgrig in command. Following shakedown off southern California Orion got underway for Pearl Harbor 23 November 1943. Arriving there on the 28th she received her first submarine Gar (SS-206) alongside for repairs two days later. On 10 December she sailed for Australia arriving at Fremantle 5 January 1944 to begin her mission of maintaining the material readiness of and an adequate stock of supplies for submarines operating in the southwest Pacific. She remained in Western Australia until 6 August when she proceeded to Mios Woendi to establish Advanced Submarine Base Able. Arriving 26 August she serviced 24 submarines and 466 surface vessels before beinge relieved 9 December by Griffin (AS-13). The next day Orion headed back to Hawaii for overhaul. On 8 April 1945 she sailed west again. At Saipan between 23 April and 1 September she served as CTG 17.7 and as SOPA (Admin) for Tanapag Harbor in addition to her tender and repair activi ties which were performed for over 300 ships. As the formal surrender documents were being signed in Tokyo Bay Orion was en route to the United States. Assigned to the Atlantic Fleet she operated off the east coast for four months then sailed south to Balboa C. Z. Taking up duties with SubRon 6 24 January 1946 she remained in the Canal Zone with one interruption for overhaul until 11 May 1949. Then with SubRon 6 she steamed to Norfolk her new homeport. After that change of homeport Orion continued to service SubRon 6 at Norfolk and during fleet exercises in the Caribbean. 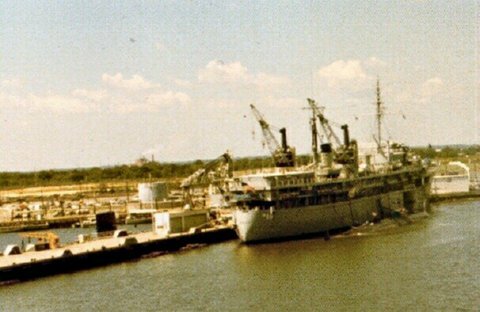 A FRAM II overhaul and conversion to nuclear support 6 September 1960-25 February 1961 was followed by refresher training off Cuba. In June her first nuclear submarine job came alongside in the form of Shark (SSN-591). Three years later she added foreign nuclear submarines to her long list of services performed after completing work on HMS Dreadnought. Support of SubRon 6 however has continued to be Orion's primary mission. Into 1970 she services the conventional and nuclear powered ships of that squadron from the Destroyer/Submarine Piers at Norfolk.